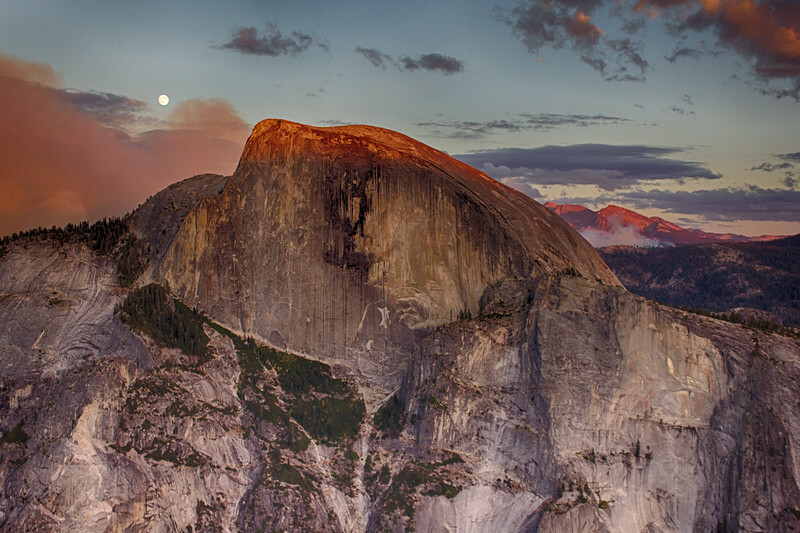 With a full moon rising, the last rays of light touch the summit of Half Dome, as the "Meadow Fire" rages behind in the Little YosemiteWith a full moon rising, the last rays of light touch the summit of Half Dome, as the "Meadow Fire" rages behind in the Little Yosemite Valley. All afternoon helicopters were landing and taking off from the summit every few minutes, evacuating over 100 climbers and hikers. Climbing up the Half Dome cables, and being air-lifted off, was their only escape. How cool would that be? Thankfully, nobody was hurt, and the fire was controlled within a few days. I was fortunate to have a day-long ring-side seat, from North Dome. Valley. Earlier in the day, helicopters were landing and taking off from the summit every few minutes, evacuating over 100 climbers and hikers. Climbing the Half Dome cables, and being air-lifted off, was their only escape. How cool would that be? And I had a day-long ringside seat, from North Dome.